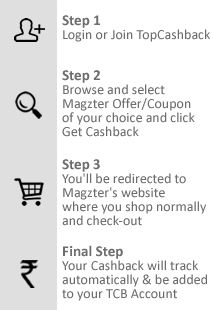 Sign up for free and just shop with Magzter as normal. Our average member earns over ₹5900 cashback a year. Magzter is the world's largest and fastest growing cross platform global digital magazine store and newsstand. Magzter is headquartered in New York is registered as a Delaware C Corp. The Magzter app was launched in June 2011 and is currently available across multiple devices. Magzter presents a unique revenue-share based business model to publishers that makes it easy for them to offer digital editions of their magazines globally with NO upfront cost. Magzter is the only self-service newsstand that offers publishers a host of special tools that simplifies the digital publishing process. Magzter has to its credit the patented Orey Click Publishing System which has facilitated the move from print to digital for publication houses all around the globe. Pushing boundaries with technology and staying perseverant to the cause of digital publishing; a world-class reading experience is what Magzter gives its users.